Today I’m feeling a little symptomatic. If you’ve ever felt (or are currently feeling) like you’re the spinning, rainbow-colored circle on your computer…you’re NOT ALONE. In today’s episode I share what’s helping me reboot. When this happens, the first thing I do is a quick SYSTEMS CHECK. If I get “symptomatic” because my body gets run down, there’s usually at least one (or more) of these things that are a “NO”…or I’m NOT handling stress well. 1. Have I been getting enough rest? 2. Have I been eating well? 3. Have I been exercising well? 4. Have I been getting my regular chiropractic adjustments? 5. How’s my stress level? All of them checked out beautifully with a “YES”, except number 2. Often when my schedule gets real intense, I forget to eat. Yep, it’s time to nourish my body well! Remember, your body and life are always talking to you. I guess I haven’t been listening real well lately. Perhaps it’s because I’m talking so much. Oops! It’s vital that we listen to our feelings. Even when we can’t necessarily put a label on them. Sometimes it’s simply the feeling of, “I’m done.” Which is how I’ve felt the past couple days. Our feelings (inner knowing) will tell us what we need. They’re like the letters, words, and sentences to the stories we’re telling. Give your body and mind what they’re asking for. Perhaps it’s a nap. Close your eyes. Then open them back up, and close some windows. Save what you need. Close it down. Sometimes it’s one at a time. Sometimes it’s a whole group at a time. Where do you need to close some windows? Or make a mass exit? Ask yourself WHY you’re even keeping some of these things open. 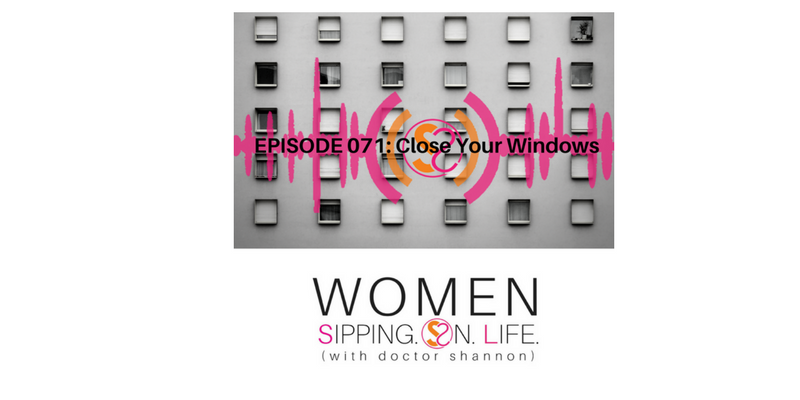 Where do you feel like you’re spinning a little and have some “windows” that need to be closed? Write them down. Write out a plan and do ONE thing at a time. But first…if needed, take a little Happy Nappy and get revitalized, rejuvenated, and refreshed.